﻿ Khedira: "Cristiano Ronaldo is very polite and respectful to others"
02.08.2011 » Khedira: "Cristiano Ronaldo is very polite and respectful to others"
Real Madrid midfielder, Sami Khedira, granted an interview to FIFA and talked about his adventure in Spanish lands, 12 months after having signed with the Merengues. Khedira shined in the Germany World Cup 2010, and got transfered from Stuttgart to Real Madrid in the last summer, for a transfer fee around 15 million euros. The German player said that Cristiano Ronaldo is a very polite person and the best in the World alongside with Barcelona's Lionel Messi. One year after having joined Real Madrid, Sami Khedira decided to grant an interview and revealed some of the keys to his success in Madrid. The 24 years old German midfielder, is confident that he'll have a more important role this season and he doesn't hide his admiration for Cristiano Ronaldo and José Mourinho. Khedira regards Ronaldo as a very graceful person who has a different personaly on and off the pitch, as a way of shielding himself from all the harassment and pressure made by football fans and the press. Khedira started by talking about his first season in Real Madrid. The German player reckonized that there were some significant differences between life in Germany and life in Spain: "On average, I sleep two hours less at night because that's the Spanish way of life. People here really know how to enjoy life and after our work is done in the club, now I can also find some time to relax and have fun." Khedira assumed that the key for his success and assure a place in the starting eleven last year, was to understand what José Mourinho wanted from him: "I had to get used to a new system	and understand what Mourinho expected from me. Thankfully, I did that succesfuly, so I was able to be in the starting line-up for many times. I'm very pleased with the way I've been developping in Madrid and I expect to get even better this season. I hope I can have a more important role in the midfield, similarly to the one I have in the German National Team." 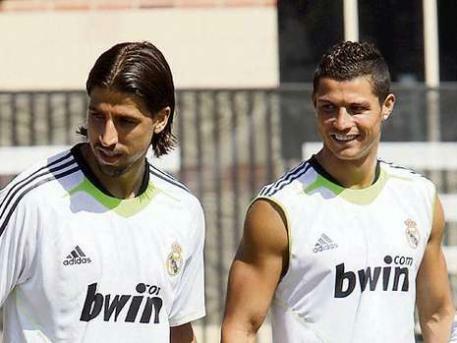 Sami Khedira also confessed that his first days in Madrid weren't exactly easy, mostly due to the language barrier. However, Rafael van der Vaart, Dudek and Cristiano Ronaldo played a major role in helping Khedira: "Rafa was always on my side, because he can speak both Spanish and German, but Jerzy Dudek was also very important. Cristiano Ronaldo was very helpful as well and we chatted often in English. Ronaldo helped me a lot on and off the field!". That's exactly the moment in the interview where Khedira described Cristiano Ronaldo. The German International has nothing but compliments when talking about CR7. Khedira: "You should never judge other people from distance. Cristiano Ronaldo is obviously the best footballer in the World, as it is Lionel Messi from Barcelona. People are always looking to take a photo next to him, or ask for an autograph and that can't be easy for him to deal with, everytime single time. Ronaldo playing style is very beautiful and attractive, but in the other hand, it may also provoke and challenge defenders and other teams fans. But I must say that when Cristiano Ronaldo leaves the field and enters the dressing room, he no longer acts as a superstar. He's simply Cristiano Ronaldo, a normal person, who is very polite and respectful to others. CR7 is also very helpful as I mentioned before and a very ambitious person, who always wants to win. People have to understand that Ronaldo is just trying to live a normal life, being aware of the fame and media attention a person on his position certainly has." After having talked a lot about Cristiano Ronaldo, there was still for Khedira to leave a few words about Real Madrid coach, José Mourinho. The Portuguese manager is definately one of most famous public figures in this sport and Khedira loves to work with him: "When I first talked to him before signing, he showed me what his project was and I must say it's all turning into reality these days. He respects everyone and he's willing to do anything for his team's success. Mourinho is a man who lives 24 hours per day for football, always thinking about the team and how it may be possible to improve our performances and skills. There's no doubts that he has a huge ammount of pressure coming from all directions throughout the entire year, but he always manages to be very pleasant to all of us in the club. One thing that distinguishes him, is the way he connects with players, because Mourinho doesn't talk exclusively about football with us, but he also shows interest about our private things and chats with us about it. That's the first time I saw something like this at this level of competition and pressure. José Mourinho knows exactly how to deal with his players and that's why he is so popular wherever he is." Before ending this interview, Sami Khedira described how a perfect midfielder should be: "The modern defensive midfielder has to be a complete player and needs to have a bit of everything. It should be a player that knows how to defend and command players near him. He should have good passing skills, but he should also be able to tackle and launch attacks. That's how I see a perfect midfielder, combining all of those skills." Real Madrid is in China since this weekend. The first match will be against Guangzhou Evergrande. Mourinho still hasn't revelaed the starting line-up, but Cristiano Ronaldo will probably be in the first choices. You can watch Juventus live stream, the game Guangzhou Evergrande vs Real Madrid online live streamings and Cristiano Ronaldo playing, inside the Live Games Streams section. Countdown clock for the game is shown in the top right corner of this site. As a bonus, we'll leave you with a few photos from Sami Khedira's girlfriend, a 23 years old German fashion model and television host (who by the way, isn't the girl spotted in a Real Madrid pratice a few days ago in Los Angeles, when Cristiano Ronaldo, Marcelo, Fábio Coentrão and Mourinho got caught looking at a blond girl).